Christy on irrigation and regional temperature effects | Watts Up With That? This press release below from Columbia University shown below suggests that irrigation cools the region undergoing irrigation. However, a study published three years ago of California’s central valley by Dr. John Christy suggests exactly the opposite. See this WUWT post from 2007, then read the Columbia story and decide for yourself. Dr. Christy responds via email, and I’ve added graphs and links to enhance his presentation to us. I would like to let the readers know (several of whom obviously did not read it) that the 2006 California paper (PDF here)was based on daily time series of 41 stations in the six south-central San Joaquin Valley and adjacent Sierra counties. 18 stations were in the valley, 23 in the Sierra (mainly the foothills). relevant information, then at the bottom of the spreadsheet summarized the results with a listing of the dates and reasons for establishing a segment breakpoint, in a sense treating each segment as a separate “station”. I sent the digitized metadata files for each station to the WRCC for safekeeping if for some reason I lose them. I also hand-digitized several years of DAILY TMax, TMin too – for downtown Fresno, it was about 40 years worth … a very tedious project for a grandpa like me. This method in essence provides a set of time series which can be debiased relative to each other through a method described in the paper that used mathematical game theory. By having this many stations (order 20 in Valley and Sierra separately) I have oversampled the region’s signal, thus allowing, as shown in the paper, several ways to test the resulting trends and issue statements of confidence. Since TMax is more highly coupled to the deep atmosphere (daytime mixing), TMax is therefore the better candidate to be used as a proxy for greenhouse warming since this type of warming is maximized in the troposphere according to model theory. The temperature results in this part of California (see also Christy and Hnilo 2010 on snowfall) do not provide evidence of greenhouse theory expectations. measured can be easily disrupted by many factors – warmth from surface fluxes due to irrigation, IR forcing from aerosols, buildings which increase roughness (and thus mixing) etc. When the BL is disrupted, the warmer air above the inversion is mixed downward and is evidenced by a warmer TMin than would otherwise be the case. September 12, 2010 in Agriculture, Climate data, Land use land cover change. Normally temperature stations log humidity as well as temperature. The humidity values would seem to be very relevant to a theory that irrigation has a microclimate effect. Are there any plans to revisit with an examinaton of humidity? As an amateur looking at the discussion you compiled the facts from the available data and noticed that warming of Tmin was an outcome of irrigation in the central valley as evidenced by the increase in Tmin. This new study looks at Tmax and asserts that the Tmax temperatures have been cooled by irrigation allowing them to appear to stay constant. With the water shortage (not mentioning the cause) could they not have compared irrigated land and non irrigated land in the same the same areas to establish the relationship. Further as less irrigation has been possible I might have expected a decline in Tmin although the relative change is probably hard to discover, while the crop decrease from cotton to cows is easier to discover. the TMax trend is not significantly different from zero. 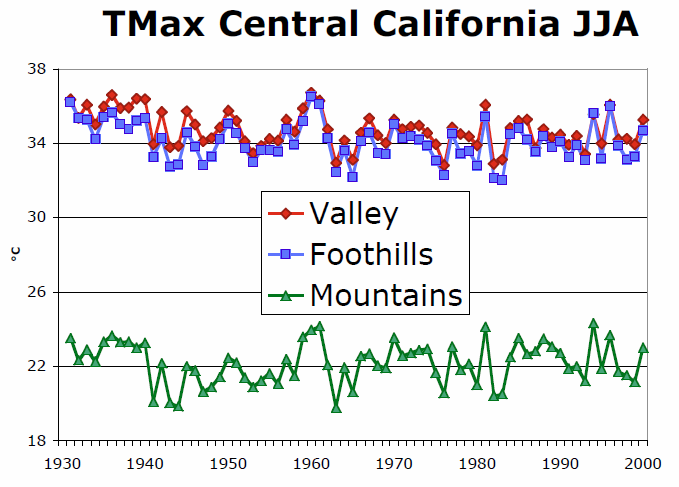 The temperature results in this part of California (see also Christy and Hnilo 2010 on snowfall) do not provide evidence of greenhouse theory expectations. Dr. Christy, thank you, now can we talk you into doing a hundred or so more of these? Heavy irrigation raises the dew point. The dew point reduces falling night time temps. Three cheers for the actual data. Have been waiting for some time for someone else with more understanding to verify that very thought. Seems that is also one of the keys aspects in UHI itself let alone irrigation. I would like to learn more of “inversions”. I know they are frequent at night, especially when still, but know little of their specific characteristics, average altitude, exactly what causes most to be nocturnal, is that partially why moist cloudy nights are generally warmer and not strictly ‘radiation’, etc. It seems reasonable to me that irrigation would raise nighttime temps. Water has a massive heat capacity relative to most other materials, so it would take some extra time to cool off land soaked in water. Conversely, it would take longer to heat it up in the daytime for the same reason. That makes sense, right? The humidity most likely increased due to irrigation. The increase in humidity increased the heat capacity of the atmosphere. This means more heat energy is required to raise the temperature of the atmosphere and greater heat energy loss is required to lower the temperature. This means you would expect lower maximum high temperatures and higher minimum temperatures. The highest temperatures in the world are recorded where there are the least amount of green house gases (where the humidity is lowest). Humidity by season can be inferred, to some extent as relatively wet/dry years, by subtracting TMin from TMax. The higher the value, the drier the year/season. A drought year has a high value, and an El Nino year has a low value. I would expect irrigated areas to have a lower TMax-TMin. For the reasons why people grow apples and such in places where cold temperatures are common one needs to understand the development of shape and color, say, in red delicious apples. That’s a side issue as regards this post. I am just an unconnected bystander observing the various discussions. I have become so skeptical of the recorded data I cannot trust any theory derived from it. The people involved almost always have an agenda and are therefor unreliable. Your loss of credibility has destroyed your ability to influence most people and the only ones jumping on your wagon seem to be politicians seeking riches or power. And where am I supposed to go if I click your screen name? Almost – the key thing, especially when dew points are above 20°F or so (say, -10°C) is latent heat released by condensation. As the ground radiates heat to a clear sky and cools to the dew point, then water vapor begins to condense as dew or frost. The heat released by that visibly slows the rate of further temperature decrease. My home weather station shows the effect quite nicely, it you look at some private weather stations at http://wunderground.com that are near you, you may see the same thing. My station is at http://home.comcast.net/~ewerme/wx/current.htm. The last couple of days don’t show the effect very well. I should write a web page with some good samples. In really cold conditions, the air is so dry that frost development doesn’t involve enough freezing water to significantly slow down cooling. In the morning, sunlight heats the ground. If there’s dew, it takes a little while to evaporate that, but eventually the cold air of the nighttime inversion warms up and convects upward. Frequently I’ll see the temperature rise to a plateau – that’s when convection begins, and the air is “well mixed” allowing air aloft to come down just as easily. This brings the daytime breezes that keeps the ground level air at a relatively steady temperature. Once the sun gets low enough, radiational cooling cools the ground, air on the hillside behind us flows downhill and the inversion returns. On our property in the New Hampshire mountains, summer evenings near the road feature a cool draft flowing downhill through the valley. The draft is strong enough that we’ve built up the rock wall around a camp fire pit to catch some of the sparks the draft blows away. Dr. John Christy, my hat is off to you. Finally, someone who cares about the data as much as I do. I came from the orbit determination/trajectory analysis side of applied mathematics and have been a data base analyst/ administrator and scientific programmer. Finally, some one who has looked at all the raw data and has not run it through the a data blender. I had only scanned the original article so I kept my mouth shut. I grew up in Phoenix in a neighbourhood that was irrigated. I use to deliver papers ( back in the day when paper boys were actually boys). The areas that were being irrigated were often noticeably warmer then those that were not. While camping, I also noticed that arroyos with water, where we would camp, were usually quit a bit warmer then the adjacent dry areas that I visited in the very early morning. Of course this is only experiential information and not data, but it demonstrated to me micro-weather caused by humidity. (BTW, the desert can get really *cold* at night!) That humidity raises Tmin, does not surprise me at all. I can’t wait to get a chance to read the paper. It sound like an attempt at real science. Old folks say there was regular snowfall here in Katoomba (Sydney Australia)-prior to the Warragamba Dam. Searching bom.gov.au isn’t a help on snowfall records. When the crops are being watered, the water is cold. It heats up in the sun of the day and gives off that heat at night along with adding to the humidity. It all sounds like a good balance to me and we got some food out of the deal. I wonder how much that “homogenization” process is biasing the temperature record. Yes, and while comparing it to Dr Christy’s detailed compilation, it would be nice to see it compared to the satelite record as well. Throwing in those few stations that do record humidity would also be of possible educational value. This new study looks at Tmax and asserts that the Tmax temperatures have been cooled by irrigation allowing them to appear to stay constant. Not sure when the study was conducted, but Tmax has been falling almost everywhere in California for the last several years. Even portions of the Mojave Desert have cooled. A possible reason for the temperatures appearing to remain constant in the Central Valley may be a result of the warming caused by irrigation. See the degree day maps at http://uspest.org. But are we permitted to drink data that hasn’t been homogenised and pasteurised for our own good? It all sounds so terrifyingly natural and straightforward to me. What would the proper authorities think of this blatant transgression? Christy says he hasn’t read the [Columbia] paper which is a pity. But since its claim is that Tmax is being depressed by irrigation, it would appear that Christy has already produced evidence countering that claim, insofar as his Sierra Tmax and valley Tmax march in sych whereas the valley Tmin trend rises and overtakes the Sierra Tmin trend. 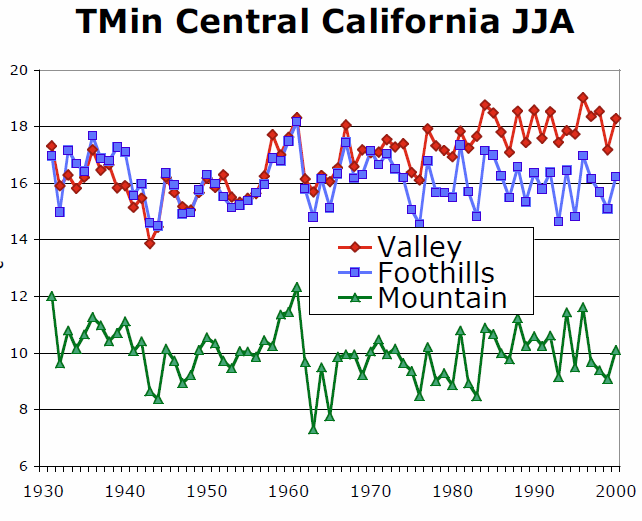 However, the foothills Tmin trend shows a strange anomaly – falling in the 1980’s where both valley and mountains are rising. Before the installation of large fans to prevent frosts, ie mixing and moving the air, some farmers used irrigation (overhead sprinklers). The water from the river or wells is obviously well above freezing. Whether this has any bearing: We always irrigated at night to reduce evaporation. Daytime irrigation with sprinklers and in particular the high pressure single guns (Self propelled irrigators) could lose up to 30% to evaporation. That is some 12o gals per min per irrigator. A valley may contain hundreds of such irrigators. High electricity prices have caused most to go low pressure irrigation systems. The key point is that you had oversampled data and therefore you can draw reliable conclusions from them. Most of the published records are severely undersampled, both in time and space, and from a signal processing perspective one cannot draw any reliable conclusions from them. My congratulations on processing the original data by hand. It is the mark of a genuine scientist who does his own work rather than leaving it to his assistants. A hunt through the internet reveals a lot of articles on “how irrigation is cooling the planet”, or “masking the rise in global temperatures”. The authors tend to be of the government grant dependency type, so their findings can be safely treated with a sack of salt. Evaporation of irrigation water obviously cools the atmosphere, while greater amounts of water vapour in the atmosphere obviously retain more heat. So, as indicated in this article, it seems entirely logical that TMin numbers should rise modestly with increased irrigation and there should be little change in TMax figures. Then there is the complication of the albedo of the surface where irrigated crops are now being grown, as opposed to what was there previously – my guess is that as the surface should be darker (depends largely on the colour of the plants’ leaves), the average albedo should decline, thereby creating a warming effect. However, among the several other ways man has increased localised water vapour levels in the atmosphere, little attention is paid to the huge amounts generated by electrical power plant cooling towers. The only thing we can be sure of is this: inconvenient facts such as those shown in Anthony’s article here will not appear in the next IPCC report. So this is yet another study that presents climate model output as though it were a scientific “result”. It is not in contradiction with Christy’s findings because it is NOT a scientific result , it is a model run. However the study is probably quite useful since when compared to REAL DATA in Christy’s study it gives a means to asses how well the models are able to match known historical climate data. The fact that the model runs give a result contrary to the real data gives a check on the accuracy of the models used. The study could be used to improve the models , it does not contradict Christy’s work. At first I found it paradoxical that irrigation would cause warming not cooling as we would expect from everyday experience. However, realising that the effect is nocturnal helps explain it. Once the conditions are right for temperature inversion and the air cools below the dew point there will condensation (dew) with the accompanying release of the latent heat of evaporation into the air. clearly areas that have had significant irrigation during hot conditions will have air heavily charged with water vapour and heavier than normal dew at night. It is very unlikely that the climate models take any account of irrigation or have any model of how irrigation has varied over the last century. That the model runs don’t match the real data is neither surprising nor a problem , as long as you don’t expect climate models to be accurate on this scale and publish their output as a “result” and start inferring what will happen in the future based on such results whilst ignoring real data. http://www.cpc.ncep.noaa.gov/products/analysis_monitoring/ensostuff/ensoyears.shtml Meaning that precipitation is an issue as well as irrigation. Don’t the authors of the Columbia University realize that if true, their study contradicts the warmers’ favorite claim that water vapor enhances the CO2 greenhouse effect? A game-changer if it were true. I find Dr. Christy’s video presentation given in the comments here EXTREMELY distressing! He is perpetuating one MYTH clearly, i.e. that CO2 concentration has gone up “significantly” with the “industrial” age. Every accepted analysis gives a very MINOR , VERY MINOR rise until after WWII. The problem is that the “temperature trends” (if believable, see my previous comments about the importance of HUMDITY, and the insanity of “average temperatures”…and Surface Stations.Org, etc.) really do not show “increases” until, really, post 1970 or 1980…. SO one has to explain the “significant lag” if the increase is due to CO2 (as a majority) contributor. This is called HEURISTIC logic, and I’m well capable of dealing with “optical depth”, and the concept of “IR Radiation Heat Transfer” in the atmosphere. (See my postings on ScribeD and Dr. Elsasser’s 1942 magnum opus on this matter.) But the HEURISTIC logic alone, should give us pause. And it is SO dissapointing to HEAR Dr. Christy being so circuitous and vauge in his verbal presentation. I expect BETTER than that from someone in his position. The video from Al Gore’s Holy Hologram at 3:22 AM is a con and is not of Dr. Christy speaking. It is of a global warming alarmist espousing the untruths and half-truths about global warming. He quotes the, now debunked, trash that 90% of climate scientists in the US believe that global warming is caused by humans. That has been debunked when it was shown that the sample size was less than 30 scientists and that it was a self-response poll for those so inclined to do so! My apoligies for not making a timely reply to your post Mr. Hultquist but after my little rant I went to bed. The life of a farmer, early to bed and all that. I fear I owe an apology to Mr. Christy also as my post could easily be taken as a personal attack on someone I have never met. Mr. Christy presented a well written post progecting his analysis of data collected by others. I have become so skeptical of the data collection that I tend to argue with all of it, yet as a farmer I am aware of the ability to preserve crops during bloom time from frost with the help of an over head irrigation system. I simply question the allusion that this is a proof of man made global warming. There are so many varibles involved in the accumulation of temperature data that it is somewhat easy to get a false interpratation without taking into account the perspective of those involved. Thank you Mr. Christy for your effort and thank you Anthony for your website. Perhaps next time I will get my sleep before making my post and be more rational in my presentation. So is the Cart pushing the Horse ? Dr Christy notes that the higher min temperatures were seasonally matched to the irrigation. Welcome to the world of Agricultural Science. I have a house in California’s central valley, near the Fresno Visalia region by Hiway 99. If I listen to the local radio Station KMJ, at about 4 AM in the morning; on the way driving to the SF Bay area, I can get the dqaily farm report, including the current agricultural crop water requirements. Eachd ay they broadcast the amount of water that the faremrs need to use for irrigation; for each local area, and also giving the “Crop Coefficients” for each farm crop; Alfalfa having the standard crop coefficient of 1.00. You multiply the daily required water by the crop coefficient to find out how much water you have to supply to that crop in that region that day. These irrigation numbers are based on what the weather is in that region that day; and the expected moisture losses that need to be replenished by irrigation. So I suggest that it is the Temperature information that is driving the amount of irrigation water; and not the other way round. And since Agricultural Science is a lot more robust and well established than “Climate Science”, I’ll go with the farmers and not the alchemists. Those farmers don’t spill a drop of water or use an ounce of pesticide; without environmental evidence (like the weather) that they need to. So I would suggest that at best these studies; either ancient or modern are moot; since it is a feedback system that the farmers are using to optimise their production; so it is not an open loop cause and effect. Dr. Christy’s analysis, from the visuals above, appears to be about central CA in the three summer months of JJA. The Puma and Cook study addresses Western North America, not central CA, and there is separate analysis for the months of JJA, and of DJF: see Figs. 9 and 10. So that is one difference between the studies — the spatial area covered, and the months covered. The other thing to note about the Puma and Cook study is that when the authors say that there is cooling, they mean relative to a control scenario without irrigation. The comparisons are results of modelling, not observations over the past century. Again, these are differences from Dr. Christy’s work, which is based upon observations in a smaller geographic area (central CA), and which examines nighttime effects (Tmin) as separate from daytime effects (Tmax). As several commenters noted on the previous thread on this subject, the net effect of slight daytime cooling and pronounced night time warming (see figures above) should be an overall warming in Dr. Christy’s work. What did Puma and Cook find? They found that the irrigation scenario in western NA produced cooler temps than the non-irrigation scenario, especially in the last 20 to 30 years . This difference is found in both winter and summer. Secondly, eyeballing the results (Figs. 9 and 10), it appears that for western NA, daily temperatures increase in either scenario, but less so in the irrigation scenario. So it appears, unless I have misread either Dr. Christy or Puma and Cook, that both seem to show slowly increasing daily temps in the last century. Dr. Christy shows that in the more limited geographical area of central CA, there is an increase in warming at night in the central valley (but not in the foothills), but no increase during the day (either location), and thus an overall increase in warming due to irrigation. Drs. Puma and Cook, however, find that irrigation causes a slight cooling over time, relative to non-irrigation, but in either case there is a temp increase over the past century in western NA. So there is directional disagreement, in that Christy finds that irrigation causes a net increase in warming due to nighttime effects (Tmin), while Puma and Cook find that irrigation over a broader geographic area decreases a warming trend without negating it. shows that increase in cloud cover. It also shows decreases in JJA temps, but mixed increases in temp effects in DJF, for worldwide analysis (Fig. 5). So the only question that could be raised, at this point, is whether the increase in evaporation from oceans, which would occur in a warmer world, would produce net temperature effects any different than those from increases in irrigation (which occur over land and mostly in temperate areas). Again, I can’t answer that question, there would be some differences, (more evaporation in the tropics? ), but your point is very well taken. One thing is for sure: Irrigations decrease poverty and increase jobs. More than that, it is meaningless if the PDO it is not considered. Anthony, can we have a climate crazy of the week award to the loon who says that it’s not Christy in the video debate (unless of course someone has magically replaced the video uploads with some Rickroll videos). Also the lowest temperatures in the world are recorded where the humidity is lowest – Antarctica. And the largest diurnal spread in temperatures in the world are recorded where the humidity is lowest – Deserts. Over the years, (1970-2006) my many visits to Phoenix have convinced me that pavement, rooftops and increased humidity due to irrigation have a pronounced effect upon perceived heat in that area. Makes sense to me, anyway, that these variables would effect actual temperatures greatly as well. When riding on a motorcycle one now directly feels the effects of humidity when passing a spriklered golf course or other watered area. Not so several years ago. The only person shown speaking in the presentation was William Schlesinger. John Christy WAS NOT shown speaking. The video appears the first part of a ‘debate’ between the cause of ‘global warming’, between William Schlesinger and John Christy. I have not tried to do any follow-up to see where the entire video was shot, or view the entire debate ( I assume it exists . . .) I did a search on William Schlesinger, and the results I found show him as an AGW proponet. The video only shows a part of William Schlesinger speaking, not John Christy. You are absolutely correct – the 9:07 video posting by Al Gore’s Holy Hologram is only of the warmist Dr. Schlesinger and not one second of talk by Dr. Christy. It is an attempt to deceive and direct WUWT readers to the ridiculous warmist arguments espoused by Dr. Schlesinger. Shame on Algore. I nominate him “prevaricator of the week”! A south american city surrounded by deserted hills, as a consequence of the prevalence of La Nina and cold Humboldt’s current running south-north along the pacific coasts, where it does not rain at all but a few millimeters/year, it did not rain then too, but, surprisingly, hills, one in special covered with sand, turned green, only because of the high temperatures. (10 degrees centigrade above normal that year). Deserts would flourish if global warming would be true, which is, unfortunately not the case. What does this mean for urban and suburban areas with automatic sprinkler systems? Assumptions about Irrigation based on model outputs differ from data compiled by Dr Christy. Results from computer model differ from measured, real-world data. My apoligies for not making a timely reply to your post Mr. Hultquist but after my little rant I went to bed. The life of a farmer, early to bed and all that. I fear I owe an apology to Mr. Christy also as my post could easily be taken as a personal attack on someone I have never met. Mr. Christy presented a well written post progecting his analysis of data collected by others. I have become so skeptical of the data collection that I tend to argue with all of it, yet as a farmer I am aware of the ability to preserve crops during bloom time from frost with the help of an over head irrigation system. (1) When did what areas of the central CA “used-to-be-desert” get irrigated? The present Canal and pumps and dams weren’t always present (because my dad built some of the tunnels and pumping stations) , and the introduction of irrigation to an area “should” have a noticeable “spike” or “drop” in temperatures at the introductory year and monthof irrigation – IF (big “IF”) – the max (daytime) and nighttime (minimum) temperature in a region is being affected by irrigation. (2) Dr Christie: When irrigation get introduced to the specific regions you have graphed? Should you not specifically be able to explain the massive sudden (2 year) change in all temps between 1961-1962? It certainly wasn’t from global average temeprature changes. 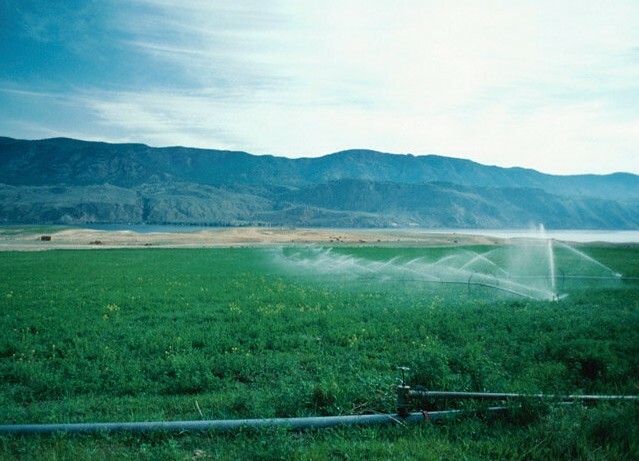 (3) Is irrigation methods (flat -land flooding in the ultra-flat lowlands only, circular spray irrigation in the moderately rough hills and “almost” flat valleys, and drip irrigation from fixed hoses in the mountains (?)) not important? (4) What are the changes in irrigation methods over the years in your chosen areas, and what irrigation methods have been (artificially!!!) cut out entirely in the last two years as the government exchanges delta smelt fish protection over farms, people, and livestock by drying up the irrigation sources? If irrigation changes temperatures, then the total stop of irrigation in three counties in the central valley in CA in the past three years due to enviro “activism”should be clearly visible in temperature records. That is, we can see the artificial drought’s impact on income, poverty levels, unemployment, banking and mortgage losses, and in quantity of crops grown. Should we not be able to see the effect of temperature in those specific counties immediately to verify the theory – or to invalidate it completely? (4) We have the temperatures digitally now thanks to your efforts. Now, instead of a year-to-year comparison plot, look at a month-to-month (two-month averages are probably better than day-to-day) comparisons of max and minimum temperatures. Irrigation is NOT year-to-year averages of water flow over aevery field every night/day. Irrigation is seasonally dependent such that many months are never watered at all, and some months are regularly flooded/sprayed. If there is “any” effect” of irrigation on temeprature, then those months should be visible. Welcome to the world of Agricultural Science. I have a house in California’s central valley, near the Fresno Visalia region by Hiway 99. If I listen to the local radio Station KMJ, at about 4 AM in the morning; on the way driving to the SF Bay area, I can get the daily farm report, including the current agricultural crop water requirements. Each day they broadcast the amount of water that the farmers need to use for irrigation; for each local area, and also giving the “Crop Coefficients” for each farm crop; Alfalfa having the standard crop coefficient of 1.00. You multiply the daily required water by the crop coefficient to find out how much water you have to supply to that crop in that region that day. And in the southern Idaho regions near my first nuclear power site inside INEL, they broadcast the 7-inch soil temperatures every morning. It took a long time to figure why. Because potatoes grow inside that first 7 inches of soil. Too warm (too cold) at that depth, it’s the wrong time to plant, plow, harvest …. Since humidity has such obvious effects on temperature, you’d think that now the tech to measure it is so cheap, that the organisation which runs the network and supplies new equipment would include a humidity sensor. Or do they but we don’t get to see the data? Well you can grow potatoes deeper than that if you know how; and the how unfortunately won’t work for the Idaho spud industry. You have to grow them in a barrel. So you put about six inches (or your seven if your prefer) of (very loose) soil in the bottom of the barrel, and you put your piece of seed potato(e) right in the middle of that just under the surface and let it sprout, and emerge from the soil. Before it gets high enough to start putting out leaves and stuff, you add a few more inches of the same very loose soil, and you cover that sucker up by a few inches. Pretty soon it will be out and about again so you add more soil and cover it. You can’t bury it too deep, because it need to see some sunlight which it is trying to reach. Once you get the barrel full of soil, then you let the plant grow normally. What you have done is forced the plant to grow a great big long root system, all the way down the middle of the barrel; and it will oblige you by growing pretty near a barrel full of potato(e)s. Great for people living on the 75th floor in Manhattan. Too bad there’s not enough very loose soil to do that all over Idaho. I stand corrected on the “con job”. I also looked up pictures of Dr. Christy, and should have noticed the remarkable UNFAMILIAR face as not being Dr. C’s. My heartfelt apologies. And my THANKS to Martin C. for the propaganda catch. Gives us an INTERESTING comment on the mechanisms of the LEFT. Harks back to “Qu’ils mangent des gâteaux” versus “Qu’ils mangent le petite gâteaux”, one of the first instances of using a convinient distortion to obtain a horrible end. Welcome to the world of Agricultural Science. … … Before it gets high enough to start putting out leaves and stuff, you add a few more inches of the same very loose soil, and you cover that sucker up by a few inches. Pretty soon it will be out and about again so you add more soil and cover it. You can’t bury it too deep, because it need to see some sunlight which it is trying to reach. Would you not need a clear-sided barrel to keep the potato’s “just-barely-covered” upper roots and the covered greenery that is trying to break free be able to sense the sunlight for more than just the 90 minutes it takes to travel across the barrel’s open top? No you don’t want a clear barrel. In fact you don’t want any sunlight falling on the potato(e)s themselves or you will heave them growing that poisonous green stuff. The shoot coming out of the eye of a potato is very toxic; and if you don’t carve every scrap of green off a potato before you cook it wou will get that bitter poisonous taste in your food. It is the growing shoot that needs the sunlight to feed down towards the root system; so you just don’t want to cover it too deep. The reason they plant the seed potato shallow. is just so that shoot can quickly emerge. Other than that the potatos themselves could probably grow at 20 feet deep if you can train the plant to grow that long a root system. Same thing applies to other similar crops like yams or other sweet potatos (Kumara for you Kiwi blokes).